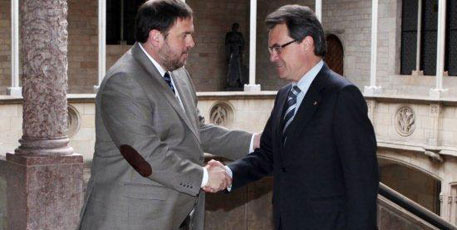 On Friday, 21st, el Molt Honorable Artur Mas was re-elected President of Generalitat de Catalunya. He obtained 71 votes out of 135. Mr. Mas was first elected in 2010. 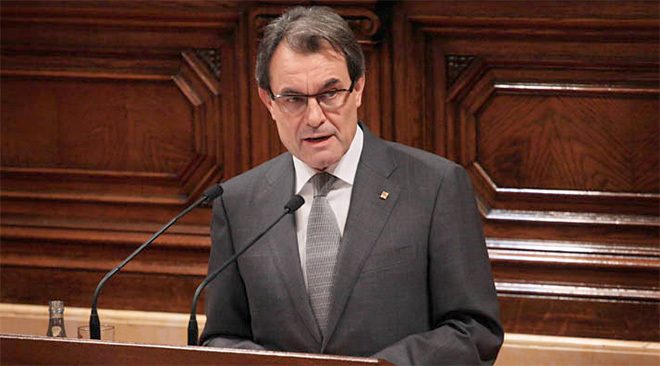 Mr. Artur Mas, supported by Reagrupament in last elections, has been elected president of the Generalitat of Catalonia in the first round of the investiture debate with a program focusing on the exercise of the right of self-determination for the People of Catalonia. 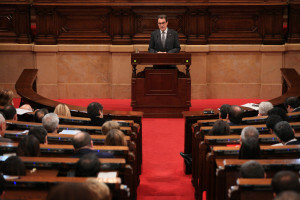 Mr. Mas during his speech to Parliament of Catalonia defended the right to self-determination, since, during the past few years there has been a process of “home rule regression” that is driving Catalonia into misery. As he did before, Mas used maritime metaphors during his speech: “The sailors are not afraid of the sea. I am not afraid either, but I’m very concerned by the country’s situation; I know we are to sail, we shall face bad weather during the journey and the boat is not in the best condition“. However, Catalonia has “a very good crew, people who will not faint, and passengers aware of the difficult jurney, yet committed and excited to get to a better port“. Mas, confirmed his commitment to set up an independence consultation in 2014 “within a favorable legal framework and willing to reach maximum consensus from political and social forces of the country.” By then, Mas expects to have statehood structures ready. Among them, he anounced that Institut Català de Finances (ICF, a public financial institution) will become a Government Bank, also advised his goal to establish a Catalan Tax Agency in order to collect all taxes in Catalonia . Mas will also tell the world, that Catalonia “aspires to be a normal country” and has “all the attributes” to “be considered a normal country among all the countries of the normal world.” Mas has interpreted the elections of November 25 came out the mandate of the people in favor of a free Catalonia, as expressed in the massive demonstration during September Eleventh, “Most Catalan people want to decide democratically, peacefully and freely its future as a nation“. Mas clearly stated that “the last word only belongs to the people and their will has to be accepted and complied with whether it does match with the initial ideas or not“. Mas, CiU´s leader, explained that the objective of “national transition” proposed two years ago, during another nomination, remains valid, because now the Spanish State, “Neither protects us, nor defends, or respects us“. The acting president, who spoke for exactly one hour, advised that reducing unemployment will remain “the biggest challenge” of the future government in this tenth legislature, also announced that, in order to prepare 2013 budget will hold a meeting with all political parties “discuss and agree on” social and welfare state policies that will be prioritary. Mas assumes that the government will not have more resources for social policies, but is committed to promoting projects contained in the agreement with ERC, including a reform of the minimum income or a national pact against poverty and social exclusion. Spanish Government is allowing local governments a very limited deficit which is “unfair and disproportionate” and warned that refusing to meet this target is not an option because “for everything we spend in excess we are not funded by anyone and, therefore, is left as debt“. This was said the same day we learned that government workers will have thir December payroll payment delayed. To address the situation, Mas has announced new taxes to be applied, some “temporary“, among them a reform of the inheritance tax, the increase in tax rates on patrimony and the taxes on nuclear power stations. Mas has renewed the offer to the other parties to share policies and made it clear that the offer to join the current government will stand “full term”.